The Paris-Dakar rally has a reputation for exhausting teams psychologically, physically, and financially. Nevertheless, when a person tries it once, he wants to keep going. What does this competition mean to you? Dakar is a drug, an adventure, a trial. You find yourself in places people don’t usually frequent. It’s different each time – sometimes we create a new route. Besides that, I’ve loved driving since I was born. I grew up in the garage with my dad, who was a truck driver. My mom drove a car as well as a motorcycle. I was a test driver for Tatra Kopřivnice, and I found myself in Africa and Arab lands as a result. So many years ago I also had a chance to take part in the Paris-Dakar rally for the first time. What is the makeup of your team, and how are the jobs assigned? This year we had one competition truck and one accompanying it. I drove the competition truck, and mechanic Petr Gilar and navigator Pepík Kalina rode with me. I usually drive the entire route myself, because switching drivers would cost us precious time. The mechanic is in charge of checking all the instruments – he keeps an eye on the temperature, and, mainly, he lets pressure out of the tires when we encounter soft sand. Is there special know-how for driving in the desert? Can you employ certain tactics? No. You always have to evaluate the situation whenever you drive at full speed. In heavy sand you can’t navigate according to your itinerary or by satellite, you have to do everything “by eye”. This requires the full concentration of the whole team. The earlier we finish, the earlier we start. Then we just hope to finish the day’s stage in daylight. Pepík Kalina. Since he’s the navigator, he has many years of experience, and he knows the terrain and the local customs. He also handles all the formalities with the organizers. But once in the truck, you have the last word, right? I can have the last word when I’m deciding to go around an obstacle, or something like that. The other guys can say whatever they want. But otherwise I respect the navigator’s judgment. Do you ever argue? What’s the atmosphere like inside the truck? It gets pretty wild sometimes. We have considerable discussions when Pepík sees something on the map he doesn’t like. On the other hand, we don’t communicate too much. We have to concentrate on the track. We’ve learned that if we let up and already see ourselves at the finish line, a few kilometers short of it something tricky crops up, we get lost, and lose minutes. What traits and skills are most important for a Dakar team? First of all is endurance, because the rally is long. Our state of health is also important. The rally is in January, which means it’s about 10° C in Europe at the start, while in Africa it’s about 15° C in the daytime and the freezing point at night. Also, the team must be an integral unit – we have to finish the rally with the same team members we started with. If one of us gives up, it’s over for all of us. So our motto, “one for all, and all for one”, is the absolute rule. Friendship is good, too: I can’t imagine sitting beside someone I didn’t know and not knowing what I could expect of him. When have your spirits hit rock bottom? Definitely in my first years, when besides the daily stages we also drove at night. Furthermore, navigation is an inexact science at best at night. Last year. I “managed” to flip the Tatra – we rolled over the cab once, and then spun five times. True, the truck was still standing on its wheels, but it wasn’t driveable. I completely fractured a lumbar vertebra. What happens emotionally in such situations? There’s absolutely no point in arguing or getting mad. It’s a matter of fractions of seconds. Suddenly you find yourself flying through the air, and there’s nothing you can do about it. In the end, we must always rely on our combined efforts to resolve the situation. 2000 declared the best Czech automotive competitor in the 20th century. What are the relationships like between competing teams? When a stage is over we help each other, lending each other tools, and so on. But on the track everyone wants to be the fastest. Then we help each other out only in crisis situations. You’ve won so many times – how do you handle losing? This year we came in seventh, but it was a victory for us anyway, since we had technical problems and doubted we’d even be able to finish. Losing is a part of competing. No one can always be the best – then winning wouldn’t matter. Paradoxically, when we lose it’s worse for our fans than it is for us. About six million crowns per truck. How much do you get if you win? The last time we won, in 2001, we received between 30 and 50 thousand francs for the whole team. So it’s a money-losing proposition. What is your main source of income? Of course it is. I do it for the experience, and also for promotion. 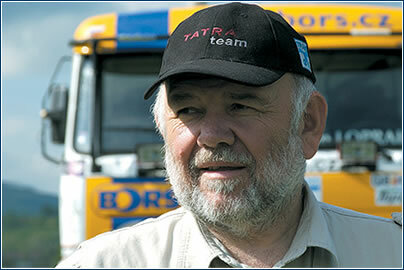 I’m a member of the Tatra team, of which my brother is the leader. He takes care of financing our participation in Dakar. I prepare the trucks all year long, and I take part in various events, trade fairs, truck shows, autograph sessions. What provides you with your greatest motivation? Each year there are many new features to the truck that we want to test in practice. We get a big kick out of that.